You can pretty much count on these for every game remaining this season (unless a personal obligation gets in the way). Prepare for another interesting/close game between these 2 teams. Positive #1: Daley was at least able to leave the ice upright. Positive #4: Fishsticks out with Robi!!!! Positive #7: Barchie finally fighting with Ivanans after he knocked Daley out of the game. Yesterday was the 3rd of 6 meetings between the two teams this season. The Stars had been 0-2-0 against them this season, both losses being 3-2; one of which being a shootout loss. Both teams seemed determine to get 2 points out of this game, and for the first two periods, it looked like it was going to be another game like the Coyotes, both goalies getting the shutout. But less than 7 minutes into the third, the LA Kings got up 1-0. Then under 5 minutes later, as Lehtinen is racing up the ice, Ribeiro passes him the puck. Lehtinen splits the D to make it 1-1. With just over a minute remaining in the game, the Sydor shot the puck from the blue line, where Ribeiro tipped it in to give them a 2-1 lead. After the goal, Johnson went after Otter, and it ended up being 4-on-4. The Kings pulled Ersberg to make it 5-on-4 and managed to get one past a scrambling Turco with 17 seconds left in the game. This one ended up needing to go to a shootout. Jack Johnson had the game on his shoulders, only to have Marty tell him no and get the 3-2 victory. And each player had a goal and an assist in the game. Jere Lehtinen is currently on a 3-game point streak, earning 1 goal and 3 assists for 4 points. It was a very good well fought game for both teams. They won’t meet again until March at the Staples Center, and yours truely will be there to root on my team! Stars are now 3rd to last in the NHL, 2nd to last in the Western Conference and dead last in the Pacific Division. What the hell happened? Last night against the Kings, it was like the Stars lost all the progress they had made. The score was still only 3-2, thanks in big party to Marty, but the rest of the team looked just like they did at the beginning of the year. No one looked like they were playing with the passion we are used to this team having. I love my Stars, but I am sick of watching only to be disappointed by not only the score, but the lack of heart. Despite losing 3-2 in the shootout, the Stars are still continuing to improve. (The loss also solidified their spot at the bottom of the Pacific Division, no where to go but up from here.) They finally have all their roster back, with Jere Lehtinen skating for the first time this season. I can’t write a real detailed summary because I didn’t see a lot of the game to be honest, my thoughts were still fixated on an event I attended yesterday. I did, however, see Dustin Brown hit Ribeiro and make him bleed and Brenden Morrow immediately go after Brown as if saying “DON’T TOUCH MY BFF! !” There was a chance that because of Brenden instigating a fight within the last 5 mintues of the game, he would automatically face a one-game suspension and Tippett would receive a $10,000 fine. But news has come down today that Morrow will NOT be suspended and Tippett will not be fined due to the circumstances. Ribeiro did return for the shootout, and got the lone Stars tally in the 5 rounds it took to declare a winner. And Ribeiro’s shootout attempt was awesome, so fancy. He slide the puck through his legs in front of Ersberg and dragged his stick to push it in. Then after he was done shushed the Kings bench. You are such a pimp. Stars will be getting revenge at home tomorrow night. What what! So anyway, the start of my day went well; it was up to the Stars to make it finish as it started. Thank goodness, they did not disappoint! Their last win was March 9th, and 20 days later they got their second win of the month. And it was a well deserved win. They played hard and it showed. Not only did we win, but we won by 5 points with the final score being 7-2. Goals were by Stéphane Robidas, Brenden Morrow, Stu Barnes, Niklas Hagman, Jere Lehtinen and Loui Eriksson got 2 goals. Robi also got 2 assists, Norstrom got 2 assists, Mike Ribeiro had 3 assists and Brad Richards had 2. 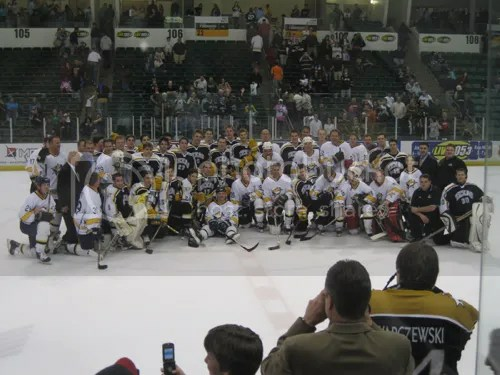 Mike Modano, Trevor Daley and Jere Lehtinen also got an assist in the game. It was definitely a team effort and it paid off. Good job guys! Now let’s keep it going tonight against the Ducks. Which obviously means it was a fantastic day. Friday morning I attended hockey practice in attempt to get Caitlin’s birthday present signed. Sadly, Mr Mittens did nothing but anger me and was included in the 6 players who snuck out. Therefore Caitlin’s present will have to go unsigned for now. Brad Richards was also one to sneak out, and he remains the one player I have yet had the pleasure to meet. The good news? I did manage to scare the living hell out of Mark Fistric, so my morning/early afternoon was complete. We also attended the Pros vs. Prospects game Friday night. Caitlin managed to get us some amazing tickets, right behind the Prospects bench by the tunnel. The game was a ton of fun. Lots of laughing, which is what is most important about hockey. At least in my opinion. Some great moments included Modano hi-fiving the Easter Bunny. It was also extremely amusing to see everyone start surrounding Vinnie Paul (from Pantera) when he showed up after the first period. As far as Saturday goes; Stars lost to the Los Angeles kings 4-2. That’s all I’m saying about that. And with that, I will leave you on a high note, with fun pictures from Friday of both Stars practice and the Pros vs. Prospects game. Broadcast begins with a shot of the Staples Center in LA. Razor has a horrible goatee that is just not working for him. Ralph starts out by mentioning that Zubov is out tonight along with Boucher, Jokinen, Lehtinen and Boucher. I agree with Razor that he shouldn’t have played in Chicago or in St. Louis. Let’s just hope that Niskanen does not tank like he did against the Wings when Zubov was first out. Ralph refers to the Kings as the cellar dwellers, which really makes me giggle. They start mentioning Kopitar and how he’s hasn’t really produced against the Stars. They show a flashback of the worst game ever, when the Stars lost 6-5 to the Kings after leading 4-0. Let’s not remind me of that, okay guys? Thanks. While playing the national anthem, they are showing the Stars bench and I am very pleased to see that it appears Eriksson chopped off his mane. 20:00: Stars start with Norstrom with Niskanen; Halpern, Barch and Ott the forwards. 18:37: Los Angeles takes a penalty, Johnson for hi-sticking so the PBC line gets their shot a power play. Before the puck drop, they announced a 2nd penalty on Giuliano, so it’s 2 minutes on a 5-on-3. 18:10: Slip of the tongue, Ralph calls Niskanen Zubov. No matter how hard the coaches are for Niskanen, he will never be Zubov or even close to his caliber, so let’s not make that mistake again Ralphie. 17:26: Blake overpowers Niskanen to clear the puck, not that it’s hard. 16:40: Halpern gets one past LaBarbera just as the 5-on-3 runs out with nice passes from Daley and Eriksson! Halperns 9th of the season! Maybe Jaroslov Modry had the right idea when he pushed the net onto Jean-Sebastien Aubin, the Kings net minder. It might have prevented the horribleness that was this game for the L.A. Kings, who lost 4-1. Dallas pretty much owned the game thanks to the greatness that is the Stars top-scoring line. First off, they honored Sergei Zubov before the game on his 600th assist. Now, was it just me or did he look totally uncomfortable? Not only during the ceremony, but also during the first intermission interview. Antti Miettinen had a record night, tallying 1 goal and 2 assists for 3 points, which puts him at a 4-game point streak. He really seems to have great chemistry with the Ribeiro-Morrow line while Lehtinen is away. Ribeiro gave him what I think is one of the best compliments he could receive. “(Miettinen) can play both sides,” Ribeiro said. “He’s a great forechecker. He’s good with the puck. He can get creative. He makes me think of a young (Lehtinen). Brenden Morrow managed to tally a goal and an assist in the game. He also received a 2-minute minor for tripping. What a trifecta. Despite looking uncomfortable even a bit after the ceremony due to all the what seemed to be unwanted attention, Zubov was amazing as always getting 2 assists on the night. He still keeps the title of highest scoring defensivemen in the league, since Detroit Red Wings’ Nicklas Lidstrom had no points in tonights game against Edmonton (which Detroit lost btw, good job Oilers. Never thought I’d say that.) Mike Modano also contributed with an assist on the 2nd period power play goal from Ribeiro. Turco did his part as always, stopping 27 of 28 shots. Well done Turco, well done. The Stars were also 100% on the Power Play tonight. Good job guys. The three stars of the night were all Stars, as they should have been. Third was Morrow, though I think it should have been Turco with all the sweet saves he made. (Though Morrow did play amazing as well.) Miettinen came up second (2 games in a row, good job Miettinen! ), and Ribeiro took the number one spot. All in all, tonight was a great and fun game to watch. Stars travel tomorrow to San Jose to take on the Sharks in the Shark Tank Saturday afternoon.